Whether you’re raising pigs in your backyard or have a large hog operation, dispensing feed to your animals is essential for keeping them healthy and growing. To make this job a whole lot easier and more efficient, the use of a fill-and-forget feeder is a necessity and a great convenience. The use of top-of-the-line Sioux Steel pig feeders and hog feeders will provide the most convenient and efficient feed delivery system for you and your swine. Pigs are defined as weighing 120 pounds or less and technically anything over 120 pounds is considered a hog. That’s not to say that they wouldn’t eat out of each others feeders, but the difference in appetite between pigs and hogs will require different feeder holding capacities to allow for an efficient feeding system. Pig feeders are designed for smaller animals and are typically kept indoors while they grow in size. 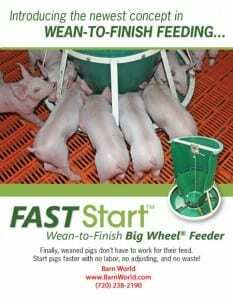 The smallest pig feeders are called nursery feeders and are designed for pigs that are weaning size up to 90 pounds. These feeders are made from polyethylene and have a metal frame that connect the hopper section to the feeding trough below. 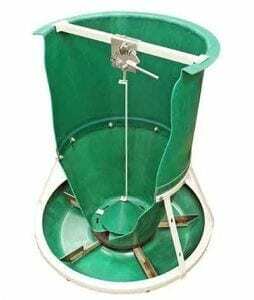 The polyethylene hopper prevents any kind of rust or corrosion from eating away at the feeder and promotes longevity in the life of the feeder. 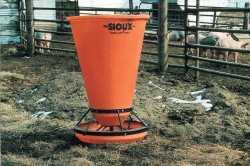 The feeder is available in 2 bushels or 3 bushels and both sizes have a 20 inch feed pan and six feeding stations. 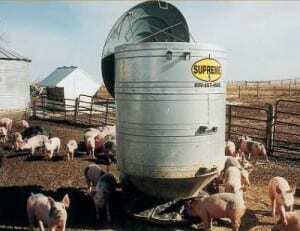 The next size up is the six bushel grower feeder that feeds pigs from 40 pounds all the way up to market weight. It has a slightly larger 28 inch feed pan and allows for eight pigs to feed at separate feeding stations at once. Typically used to feed 50 to 55 pigs, this durable feeder has smooth inside walls to keep a constant feed flow coming freely and un-obstructed. It can dispense high moisture grains without bridging, clumping or building up inside the hopper. The finishing feeder also has a six bushel capacity but has a larger 34 inch trough. 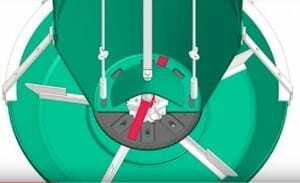 It feeds pigs from 40 pounds up to market weight and is also designed to feed 50 to 55 pigs in eight separate feeding stations. There is an optional fence-line adapter so you may feed two separated pens with one feeder. Like the other feeders, it has an animal activated feeding system that keeps an even distribution of feed around the trough. No clumping or piling up of feed on one side of the trough while the other side goes hungry. As the pigs (technically 120 pounds or less) grow larger, they will consume more and more feed which will require a feeder with larger capacities. To accommodate their growing appetite and size, a larger hog feeder is necessary to maintain the efficiency of your feed distribution system. The larger volume hog feeders are available in both poly hopper and metal hopper designs. The traditional outdoor large capacity hog feeder is made with heavy galvanized 12 gauge steel. It sits on polyethylene skids that never rust and are designed to hold the feeder off the ground. The Sioux Steel Supreme hog feeder has 12 large openings that create feeding zones so hogs can easily consume the feed undisturbed and without bickering. The trough has very strong plastic doors to protect the feed from the elements and allow individual feeding. The Supreme feeder has a convenient feed flow adjustment control that regulates the rate of feed being dispensed to the trough. The seamless top cover is made even stronger with reinforcement beads and has a ‘wide hinge’ for convenient filling. These reliable and durable hog feeders are available in 40, 60, and 80 bushel capacities and can ship anywhere in the US. 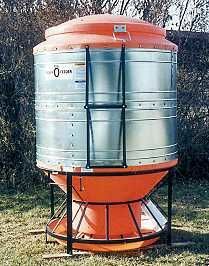 Just like the Supreme hog feeders, the Big O outdoor hog feeder is designed to hold large quantities and is available in 40, 65, and 90 bushels capacities. They all have 12 feeding stations in the trough and a side feed adjustment to regulate the feed flow. This set and forget feeder will allow your hogs to eat to their hearts content. Designed for outdoor use, the Big O feeder is made with a plastic top and trough to eliminate rust and corrosion. Even hog lot acids have no effect on the feeder. The large 56 inch polyethylene lid not only protects your precious feed from the fiercest winds and rains, but also provides easy access for quick filling. The entire feeder rests on polyethylene skids so it can be moved around the yard If necessary. When looking for the most efficient and convenient way to distribute feed to your animals, consider the top-of-the-line Sioux Steel pig feeders and hog feeders from Barn World a top distributor of livestock supplies and cattle guards!